A pair of divers spotted the largest ever recorded great white shark, when it was feasting on a dead whale near Hawaii. Divers and photographers Mark Mohler and Kimberly Jeffries, spotted the 2.5 ton beast, which is known as ‘Deep Blue’, swimming nine miles off the coast off the Hawaiian island, Oahu, on January 13. 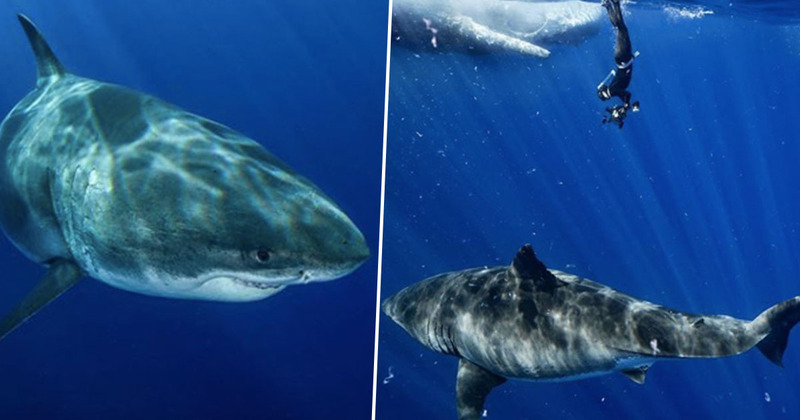 While many people might turn and run – or rather swim – for their lives after spotting the biggest shark on the planet, the incredibly brave pair decided to do the exact opposite, and actually jumped into the water to get a better look at Deep Blue. Rather them than me, that’s for sure! When Mark and Kimberly were in the water, the massive shark was distracted by a huge feast, which came in the form of a dead sperm whale. The photographers were able to get some incredible shots of the predator – which was nearly seven metres long – as it devoured its meal. According to WA Today, Deep Blue has pigment markings around her tail and gills, which make her unique and allow her to be recognised. While there’ve been a couple of other sharks in the running for biggest in the world, Deep Blue is the biggest one which has been verified. Our Planet report for decades, many sources listed two great white sharks as the largest individuals. However researchers question the reliability of the measurements, noting they were larger than any other accurately reported sightings. In the 1870s, a 10.9 metre great white was apparently captured in southern Australian waters, but in the 1970s, ichthyologist J. E. Randall examined the shark’s jaws and ‘found that the … shark was of the order of five metres in length and suggested that a mistake had been made in the original record, in 1870, of the shark’s length’, Our Planet report. An 11.3 metre shark was also supposedly seen trapped in a herring weir in Canada in the 1930s, but it’s thought this predator may have been a misidentified basking shark. Deep Blue, possibly the biggest White Shark identified at nearly 7 meters. While last spotted in Mexico, she came on a Hawaii all-you-can-eat vacation. Here, @hapakimberly drops to take some photos of her in front of a sperm whale carcass – notice all the chunks of whale and oil floating around. Kimberly was first to spot her on 13 January 2019, and Kimberly and I confirmed the ID with the white shark authority, @iphotographsharks this morning – thank you! Kimberly also shared some pictures of Deep Blue, though at the time it appears she didn’t even realise she’d stumbled upon the largest shark ever recorded. When we slipped into the water yesterday morning we had no idea what was in store for us. In search of tiger sharks we found curiously quiet waters. We didn’t have to wait long though as this ocean great revealed herself. Serene and graceful, she curiously weaved her way around us. For hours we swam drifting together through the sea in the current. We watched as she fed and swam, marveling at her round belly, perhaps she’s eating for more than one? She doesn’t have a spot tag and we’re going through the databases to ID her but she appears to be new. According to Mark, the huge, hungry predator was last seen in Mexico in 2013. Despite being so big it seems the shark managed to avoid being spotted since then, but the temptation of a sperm whale carcass drew it to the surface.